Mobile Welding Vancouver | Services | J & J Metal Works Ltd. Whether you need on-site mobile welding or in-shop metal fabrication, J & J Metal Works Ltd. is here to provide precision workmanship at fair prices. If you need structural steel, custom aluminum fabrications or skilled workmanship using other miscellaneous metals, our experienced crew is here to help. 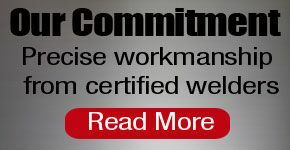 Our CWB certified shop in Greater Vancouver will fabricate and install to your specific requirements. We’ve included many of the common types of projects we handle below. If you have any questions about what we can do, please let us know. Learn more about our structural steel capabilities. Bring us your drawings and we will create it for you!